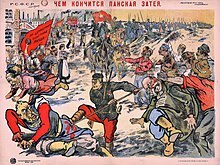 The 1920 Kiev Offensive, sometimes considered to have started the Polish–Soviet War, was an attempt by the armed forces of the newly re-emerged Poland led by Józef Piłsudski, in alliance with the Ukrainian leader Symon Petliura, to seize the territories of modern-day Ukraine which fell under the Soviet control after the Bolshevik Revolution. 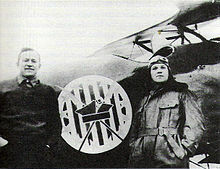 The operation led to a Soviet counteroffensive resulting in the creation of the short-lived Galician Soviet Socialist Republic, and ended amicably with the formal Peace of Riga of 1921. 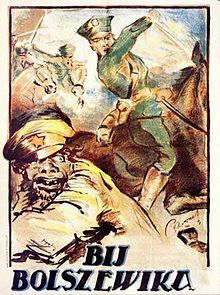 The 16th Army was a field army of the Red Army during the Russian Civil War era. It was originally formed as the Western Army on November 15, 1918, by the Russian SFSR for the purpose of recovering territories lost by the Russian Empire during the First World War and establishing Soviet republics in those territories. 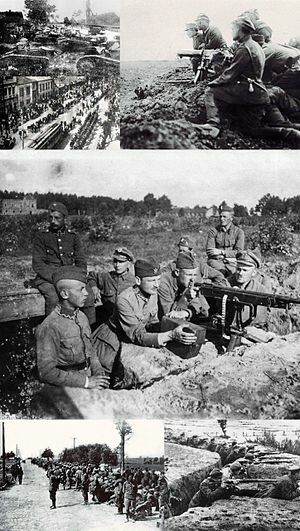 The Western Army engaged various local forces from the Baltic States, Belarus, Poland and Ukraine, and its actions contributed to starting the Polish–Soviet War of 1919–1920. 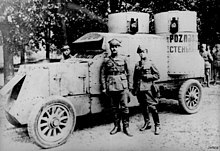 The army fought in the Polish–Soviet War under the command of Nikolai Sollogub and advanced westwards into Poland in July 1920 before being thrown back during the Battle of Warsaw in August. 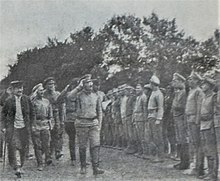 The army retreated east into Belarus and was disbanded in May 1921. The Battle of the Niemen River was the second-greatest battle of the Polish–Soviet War. It took place near the middle Neman River between the cities of Suwałki, Grodno and Białystok. 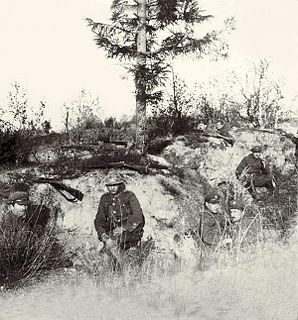 After having suffered almost complete defeat in the Battle of Warsaw, Mikhail Tukhachevski's Red Army forces tried to establish a defensive line, against Józef Piłsudski's counter-attacking Polish Army, running northward from the Polish-Lithuanian border to Polesie, and centering on Grodno. Between September 15 and September 25, 1920, the Poles outflanked the Soviets, once again defeating them. After the mid-October Battle of the Szczara River, the Polish Army had reached the Tarnopol-Dubno-Minsk-Drissa line. Lucjan Żeligowski was a Polish general, politician, military commander and veteran of World War I, the Polish-Soviet War and World War II. He is mostly remembered for his role in Żeligowski's Mutiny and as head of a short-lived Republic of Central Lithuania. 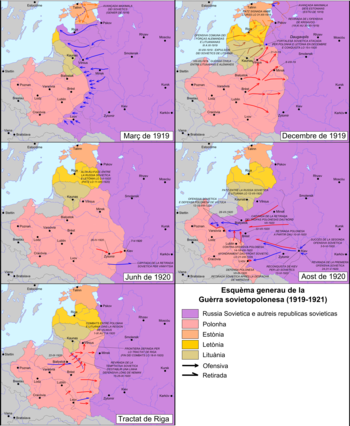 Operation Mińsk was a military offensive of the Polish Army resulting in the recapture of Minsk from the Bolsheviks around August 8, 1919. 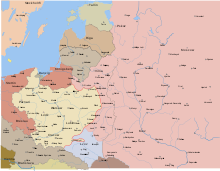 The victory allowed the Polish troops to advance further into the Russian-controlled Lithuania and Belarus, and thus present the Bolsheviks with a fait accompli by driving them out of the newly acquired territories. The main Polish attack was in the direction of Maladzechna, Minsk, and Polatsk along the railroad lines. On August 6 the Polish Army took over Slutsk, and Minsk two days later. The Polish control over the railway lines, prevented the Russians from bringing in reinforcements. By the end of August, the forces of Józef Piłsudski took over Barysau and Babruisk, and forced Lenin to return to the negotiating table. Operation Mińsk was considered critical for the confirmation of Polish presence in the Kresy macroregion at the time of the reconstitution of sovereign Poland. 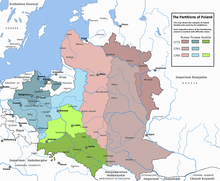 The negotiations however, failed, which led to the Soviet invasion of ethnic Poland in July 1920. The Vilna offensive was a campaign of the Polish–Soviet War of 1919–1921. The Polish army launched an offensive on April 16, 1919, to take Vilnius from the Red Army. After three days of street fighting from April 19–21, the city was captured by Polish forces, causing the Red Army to retreat. During the offensive, the Poles also succeeded in securing the nearby cities of Lida, Pinsk, Navahrudak, and Baranovichi. The Treaty of Warsaw of April 1920 was a military-economical alliance between the Second Polish Republic, represented by Józef Piłsudski, and the Ukrainian People's Republic, represented by Symon Petliura, against Bolshevik Russia. The treaty was signed on 21 April 1920, with a military addendum on 24 April. 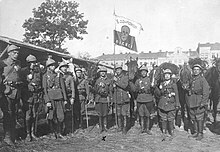 Żeligowski's Mutiny was a Polish military operation led by General Lucjan Żeligowski in October 1920, which resulted in the creation of the Republic of Central Lithuania. Polish Chief of State Józef Piłsudski had surreptitiously ordered Żeligowski to carry out the operation, and revealed the truth several years later. The area was formally annexed by Poland in 1922 and internationally recognized as Polish territory in 1923. Nevertheless, Lithuania continued to claim the Vilnius region. The Battle of Radzymin took place during the Polish–Soviet War (1919–21). The battle occurred near the town of Radzymin, some 20 kilometres (12 mi) north-east of Warsaw, between August 13 and 16, 1920. Along with the Battle of Ossów and the Polish counteroffensive from the Wieprz River area, this engagement was a key part of what later became known as the Battle of Warsaw. It also proved to be one of the bloodiest and most intense battles of the Polish-Soviet War.